It's been a year since Donald Trump's surprise victory, but his biggest fans — white supremacists, conspiracy theorists and far-right trolls — are starting to stall in their mission to ride Trump's presidency towards mainstream acceptance of their views. Sure, they've had some remarkable wins. Tucker Carlson continues to normalize white nationalism, both on Fox News and through the Daily Caller, his online publication. Trump continues to dish out red meat, attacking NFL players and any other black people, including a pregnant war widow, who dare speak a word of criticism. Attorney General Jeff Sessions and White House Chief of Staff John Kelly are still supporting Trump's racist agenda. Still, after the summer's rally in Charlottesville — which was meant to be a triumph for white nationalism, but ended up creating a national backlash — the far right is struggling a bit. Social media followers and page views appear to be leveling off. Some of the main figures who served as conduits between the white nationalist far right and the mainstream conservative movement — such as Steve Bannon, Milo Yiannopoulos and Gavin McInnes — have struggled to maintain their footing in the public square. Despite all this, there's reason to be concerned that the "alt-right" is regrouping and finding new ways to normalize white nationalist rhetoric. Despite being diffuse and very loosely organized, "alt-righters" have become skilled at painting themselves as victims and generating sympathetic coverage. Two recent campaigns by online "alt-right" activists show that, despite some setbacks, they're getting better at ingratiating themselves with mainstream conservatives. Jared Holt, a research associate for People for the American Way, recently blogged at Right Wing Watch about a particularly insidious effort to popularize white supremacist ideas by trolling liberals: Hanging signs on college campuses or other public spaces that say, "It's OK to be white." The campaign started in October, after some racist members of the 4chan network saw a news story about the fact that signs with slogans like "Don’t apologize for being white" had cropped up at Boston College, near the location of a planned rally against racism. The signs were obviously intended to paint anti-racism as inherently anti-white. The 4channers loved it, but realized the strategy would work even better if such signs were completely decontextualized. Near a rally against racism, it's clear enough that signs like that are meant to embolden white racism and hurt people of color. But when they were displayed in random places, with no context at all, white supremacists could claim the signs were innocent — and that anyone who objects to them is a bigot who believes there is something wrong with being white. Holt told Salon that, in his research, he found more than 100 instances of the signs — always with the same language, "It's OK to be white" — popping up across the country, typically at colleges and universities. To achieve this, the people behind the campaign, who are mostly anonymous, have tried to conceal the origins of the signs, instructing people who hung them to deny any association with the "alt-right." This is part of a larger strategy aimed at garnering sympathy from mainstream conservatives, or "normies": Rather than argue directly for racist or fascist beliefs, "alt-righters" paint themselves as victims of "political correctness," playing directly to the conservative longing to believe that liberals are the intolerant bad guys in our national drama. 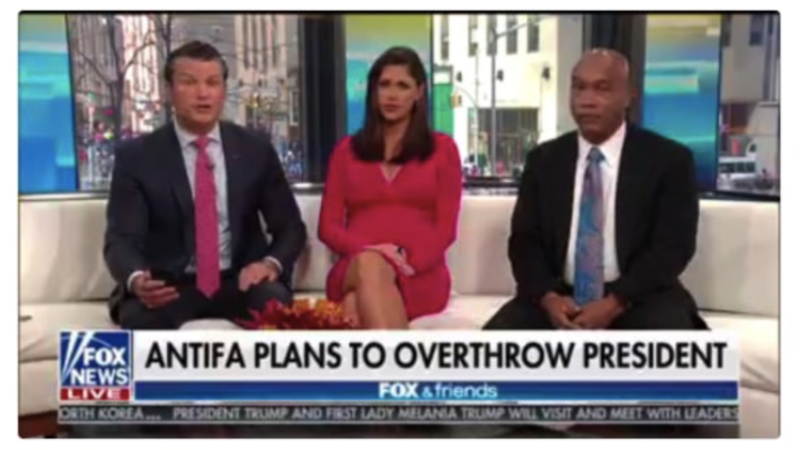 Last week, the "alt-right" had tremendous success with this strategy by floating a ludicrous conspiracy theory that antifa activists were planning a violent uprising against Trump and his supporters, which was supposedly to begin on Nov. 4. For two months, conspiracy theorists whipped themselves into a frenzy over protests organized by a group called Refuse Fascism, with right-wing sites like WorldNetDaily and InfoWars claiming that the planned rallies were just the cover story for an armed revolution — and demanding that Trump supporters show up, armed, to fight back. Despite the fact that this was an obviously delusional notion, and one Snopes had already debunked, the "alt-right" successfully hooked somewhat more reputable conservative publications into their paranoid hysteria. What's going on here is crude but effective: Get mainstream conservatives to fear and despise the anti-fascist, which might help fascism look reassuring or reasonable by comparison. "They’re trying to mainstream themselves by playing this victim card," Holt said, adding that this was particularly ironic "for a movement that likes to throw around the term ‘cuck,'" a term, like "snowflake", that "alt-righters" use to demonize their opponents as weak and oversensitive. There's no small amount of projection going on here. It's a staple of far-right ideology that liberals play the victim and make up imaginary oppressions, but in reality it's the "alt-right" that is creating conspiracy theories and spreading lies about how liberals are committing or enabling "white genocide." Sometimes it seems like these folks spend their lives fighting against fictional threats that they themselves invented.